Larry Hurtado, Core OT texts and their Christological Interpretation; Ian Malcolm & Matthew Malcolm, All the Scriptures; Roland Deines, Scripture and Jesus; Donald West, Acts 4 and Prayer; Ben Sutton, Acts 10 and Peter; Mark Seifrid, Scripture and Paul; Lionel Windsor, Seed, Many, One in Galatians; Martin Foord, Psalm 68 in Ephesians; Mark Keown, Scripture in Philippians; Allan Chapple, Scripture and 1 Peter; Matthew Malcolm, Triadic Figures in Hebrews; Rory Shiner, Reading the New Testament from the Outside. 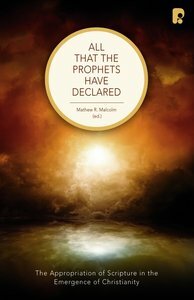 About "All That the Prophets Have Declared"
Jesus and the New Testament writers use their Scriptures in ways that may seem foreign to those who use those same Scriptures today.This volume considers how the identities and missions of Jesus and his earliest followers were informed by their surprising readings of the Scriptures. Contents: Larry Hurtado, Core OT texts and their Christological Interpretation; Ian Malcolm & Matthew Malcolm, All the Scriptures; Roland Deines, Scripture and Jesus; Donald West, Acts 4 and Prayer; Ben Sutton, Acts 10 and Peter; Mark Seifrid, Scripture and Paul; Lionel Windsor, Seed, Many, One in Galatians; Martin Foord, Psalm 68 in Ephesians; Mark Keown, Scripture in Philippians; Allan Chapple, Scripture and 1 Peter; Matthew Malcolm, Triadic Figures in Hebrews; Rory Shiner, Reading the New Testament from the Outside. Contents: Larry Hurtado, 'core Ot Texts And Their Christological Interpretation'; Ian Malcolm & Matthew Malcolm, 'all The Scriptures'; Roland Deines, 'scripture And Jesus'; Donald West, 'acts 4 And Prayer'; Ben Sutton, 'acts 10 And Peter'; Mark Seifrid, 'scripture And Paul'; Lionel Windsor, 'seed, Many, One In Galatians'; Martin Foord, 'psalm 68 In Ephesians'; Mark Keown, 'scripture In Philippians'; Allan Chapple, 'scripture And 1 Peter'; Matthew Malcolm, 'triadic Figures In Hebrews'; Rory Shiner, 'reading The New Testament From The Outside'.